As a building located on the National Register of Historic Place, living in Chatsworth Apartments affords students the chance to enjoy early 20th architecture and designs while embracing 21st-century values of inclusion and community. 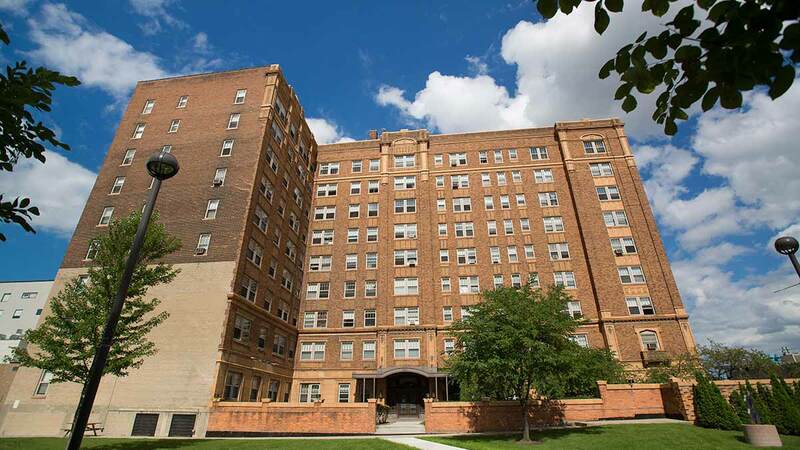 Opened in 1928, the Chatsworth apartments offers Wane Statue University junior or higher students, faculty, and staff an affordable and convenient opportunity to live on our campus and in the heart of vibrant Midtown Detroit. Living in an apartment at WSU also provides additional opportunities to engage in the WSU community through events, programs, or student organizations. Beyond what is offered inside the building, you're still only a short walk from the Student Center, Mort Harris Recreation Center, and the Q-Line rail connecting the Midtown neighborhood with the Downtown and New Center areas. We hope to see you join our community soon! Please note that the Chatsworth Towers Apartments will be closing for renovation beginning May 1st, 2019.